The U.S. Unemployment Rate hit a 26-year high today, as it reached 10.2%. Take a look at the graphic above released today by the House Republican Conference. It shows what President Obama said would happen if his $787 Billion Stimulus Bill was passed, and what would happen if it was rejected. Obama said if rejected, unemployment could rise to almost 9%, and if enacted, it would be kept below 8%. Here we stand at 10.2%. 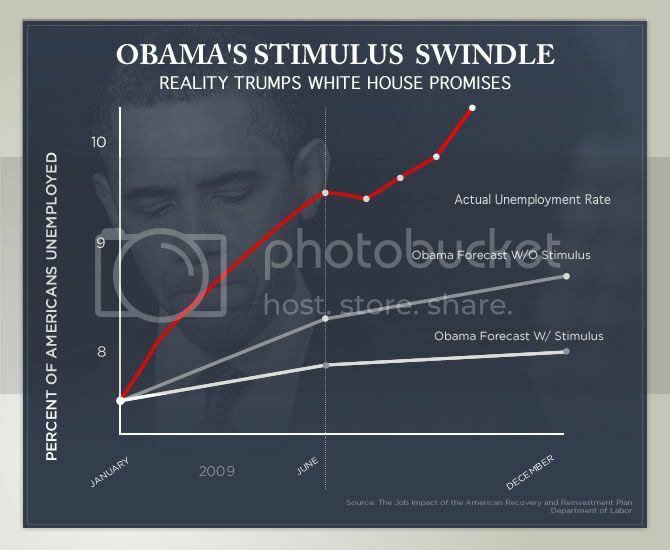 Yet, we are supposed to believe the Stimulus Plan is working? The 10.2 percent figure is well above the 9.9 percent that economists expected and breaks the psychological barrier of 10 percent, breaking double digits for the first time in 26 years. It’s the last headline the Obama administration wanted to see going into the House healthcare vote.